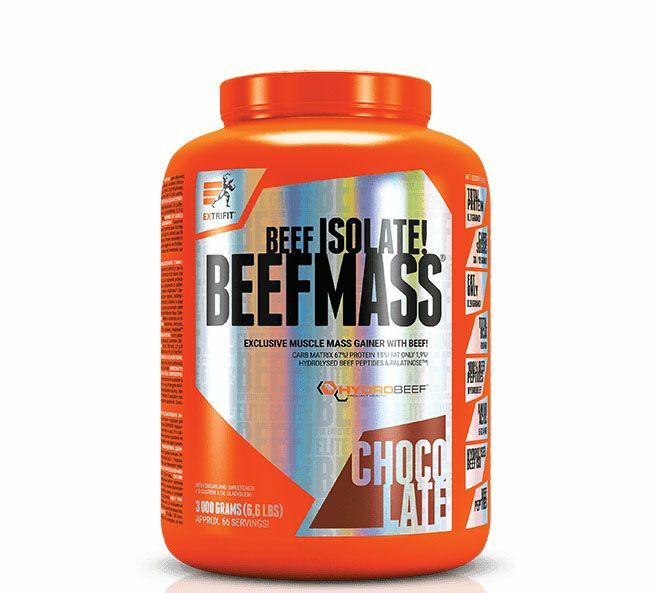 Branded beef protein isolate Hydro BEEF (hydrolyzed beef peptides) with 97 % beef protein content is foundation of our gainer Beef Mass. We added high-quality carb matrix for maximal muscle mass growth and strength increasing. Beef Mass is a new gainer containig hydrolyzed beef isolate with nearly zero content of fat and sugar. Beef protein isolate Hydro BEEF is one of the best protein sources. Beef protein intake in strength athletes is of the long tradition. Beef Mass is intended for everybody who wants to increase muscle mass and strength. BeefMass chocolate flavor does not contain any lactose. Carb part of Beef Mass® is made up ofthree carbohydrates withgradual release of glucose units: moderatelly fast maltodextrine, fast dextrose and slow PalatinoseTM (isomaltulose), carb with low glycemic index. Utilization of protein contained in Beef Mass® we supported with natural enzymes bromelain and papain in chocolate flavor and 7 enzymes in vanille-caramel flavor. The both of these flavors tastes excellently.